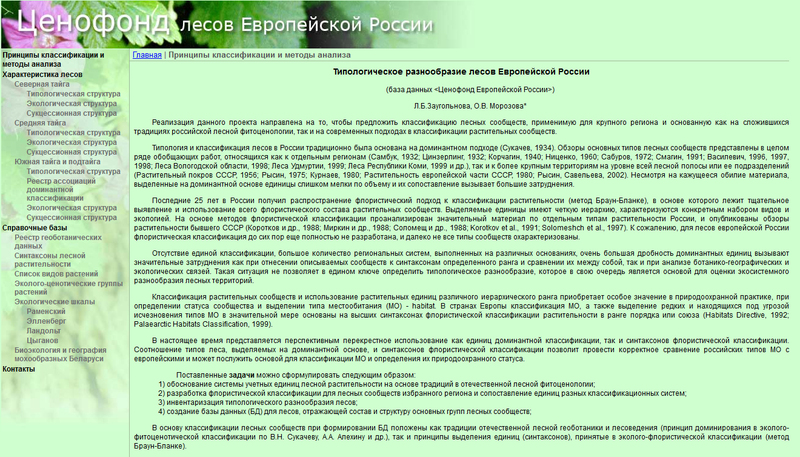 Typologic diversity of the forests of European Russia (data base “Cenotic fund of the forests of European Russia”). The realization of the project is aimed at the classification of forest communities which can be applied to a big region and based both on traditions of Russian forest phytocoenoogy and contemporary approaches to plant communities classification. The proposed classification of forest types used for this data base is based both on Russian traditional forest geobotany and forestry (dominance principle) and determining of units (syntaxons) of ecological-floristic classification. Nowadays the most perspective is combined use of dominant classification and syntaxons of the floristic classification. Interrelation of the forest types determined using dominant classification and syntaxons of the floristic classification allows correct comparison of Russian types with European types and serves a base for its classification and determining its conservation status.